Stems: Erect, solitary, stout, densely woolly. Leaves: Alternate, simple, sessile, oblanceolate, 3-20 inches long, 1-6 inches wide, densely woolly; margins mostly entire; upper leaves reduced; leafy wings extending downward from bases; tips pointed. Inflorescences: Spikes, elongate, densely flowered, terminal. Flowers: .5 to 1.25 inch wide; calyces 5-lobed, lobes lanceolate, densely woolly; corollas 5-lobed, yellow to pale yellow; stamens 5, upper 3 filaments hairy. Fruits: Capsules, globe-shaped to broadly egg-shaped, about 1/3 inch long, pubescent; seeds numerous, tiny, ridged, brown. Habitat: Disturbed areas, roadsides, rocky hills, fields, and waste ground. Origin: Introduced from Europe and now naturalized. 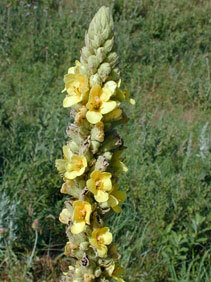 Uses: Native Americans used flannel mullein to treat colds, coughs, rheumatism, cuts, bronchitis, and asthma. The roots were given to teething babies to chew, and the leaves were used as ceremonial tobacco. The flowers once were boiled in lye to make a hair dye and the leaves placed in shoes as insulation against the cold. Comments: The covering of woolly hairs helps reduce water loss through evaporation.